A ‘high-ranking’ militant of Al Qaeda in the Islamic Maghreb (AQIM) has been killed in a US air strike in Libya over the weekend, the Pentagon said in a statement. The strike, the first against Al Qaeda militants in Libya, killed “two terrorists” in the country’s vast desert, the Pentagon said. The US military said Musa Abu Dawud, the senior Al Qaeda militant provided critical logistics support, funding and weapons to AQIM, enabling the terrorist group to threaten and attack American and Western interests in the region. 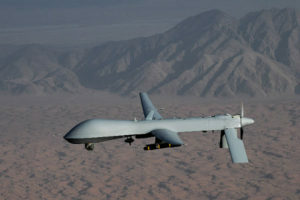 The missile fired by the American drone stroked a house in Ubari, 435 miles south of Tripoli, in the country’s southwest, a notorious haven for a deadly mix of Al Qaeda and other extremist groups in the Sahel region, it said. Colonel Cheadle described Dawud as “a significant ‘fixer’ for Al Qaeda.” The US Africa command said that no civilians were believed to have been killed in the attack. Last year, Niger agreed with American military to fly armed drone missions from Niger’s capital, Niamey. The American military is also building a $100 million drone base in Agadez, north of Niamey that is set to begin operations this year. Posted by Khalid Al Mouahidi on March 29, 2018. Filed under Zoom. You can follow any responses to this entry through the RSS 2.0. Both comments and pings are currently closed.